One Man virtuoso Charles Ross has more than one show up his sleeve. He’s best known for One Man Star Wars, and since its debut back in 2001, garnering attention worldwide, he’s expanded his repertoire to include Lord of the Rings, Batman and now Stranger Things. Of the latter two, they are not as often performed. As demand grows for specific shows, he will tour. Netflix’s season three of Stranger Things is the most anticipated television programme to come sometime in 2019 and this act will certainly develop as the series plot thickens. His energy has never waned throughout the years I have seen him perform. One Man Star Wars is part of the local May the 4th celebrations at Farquhar Auditorium at the University of Victoria in 2019 and One Man Pride and Prejudice is set to go live (dates TBA). When considering his roots with the Fringe Festival, local or otherwise, where he tests new material, I will be in line to see his take of this Jane Austen classic. It was performed at the last Edinburgh and Winnipeg Fringe Festival. I believe my English Lit profs would want me to attend. Journey into the Art of Star Wars Rebels, Oct 1st, 2019! Dark Horse Books and Lucasfilm proudly present the official look inside one of the galaxy’s most beloved shows in The Art of Star Wars Rebels (Amazon pre-order link). This book is going to be an incredible hardcover amassing art and creator commentary chronicling four seasons of adventure in a galaxy far, far away, and I am one who has put in an order right away. No animated series has stayed faithful to the defining vision which visits “The Force” in The Clone Wars and what it represented in the original trilogy. It manages to go beyond, if not surpass, in my opinion. 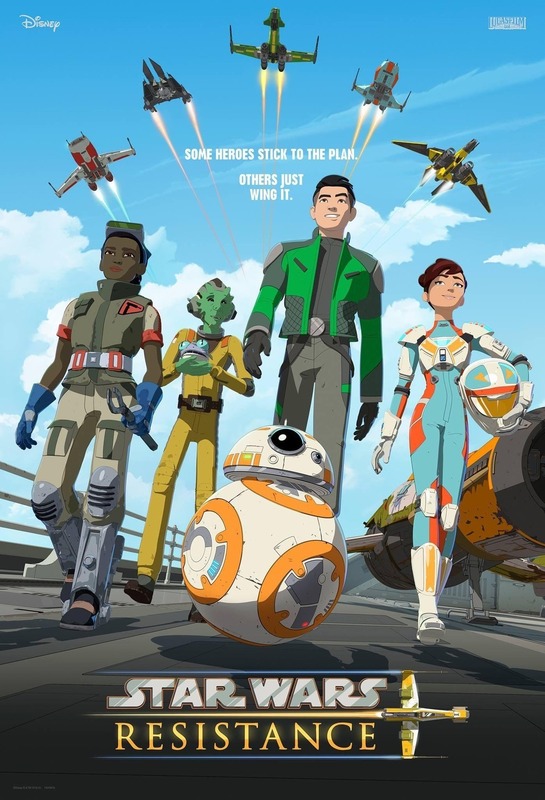 The last few episodes of the final season of Rebels ventures into new territory similar to Yoda’s adventure with Clone Wars: Lost Missions, and to anxiously wait for this book may well shed light in what Dave Filoni had in mind when those episodes were written. The Freemakers are Back in LEGO Star Wars: All Stars! The Freemakers are back! Well, sort of… time has passed since they joined the Resistance. Just when this story takes place is in the present, and Moxie Freemaker is the main protagonist of LEGO Star Wars: All-Stars. The family makes appearances and we get an origin tale that is not convoluted. In these shorts, we also see Rowan making waves since meeting Luke in “The Power at Jakku.” Much has he become in the ways of the Force. The shorts made its debut back in October as a series of shorts, and not everyone noticed. The longer 24-minute episodes have two tales and I’m in favour of these because the tales are meatier. They are a lot more enjoyable since it does not focus on Roger. They also help complete the roster of translating the diverse cast into LEGO mini-figure format. Although they are technically non-canon material, references to key moments in the series are made. Should this transition into casting real-life performers to play the animated characters, I would appreciate it. The shorts are being repeated on Disney XD, are available on Disney NOW (to cable tv subscribers) and freely available on YouTube. Altogether, they make for a terrific filler while waiting for the next live-action film.